Protein Blend (Whey Protein Isolates, Whey Protein Concentrate, Whey Peptides), Cocoa (Processed with Alkali), Artificial Flavors, Lecithin, Acesulfame Potassium, Aminogen®, Lactase. This product contains whey derived from dairy and lecithin (to improve mixability) derived from soybeans. For use as a dietary supplement only. Do not use for weight reduction. PACKETS: STORE IN A COOL, DRY PLACE. CONTENTS SOLD BY NUMBER OF PACKETS, NOT VOLUME. Protein Blend (Whey Protein Isolate, Whey Protein Concentrate, Whey Peptides), Natural and Artificial Flavors, Sprinkles (Sugar, Corn Starch, Partially Hydrogenated Vegetable Oil [Cottonseed and/or Soybean], Soy Lecithin, Dextrin, Confectioner's Glaze, Red 40, Yellow 6, Blue 1, Natural and Artificial Flavor, Yellow 5, Carnauba Wax), Lecithin, Cellulose Gum, Salt, Xanthan Gum, Sucralose, Acesulfame Potassium, Lactase. Protein Blend (Whey Protein Isolate, Whey Protein Concentrate, Whey Peptides), Natural and Artificial Flavors, Soy Lecithin, Salt, Acesulfame Potassium, Sucralose, Lactase. Protein Blend (Whey Protein Isolates, Whey Protein Concentrate, Whey Peptides), Cocoa (Processed with Alkali), Creamer (Sunflower Oil, Maltodextrin, Modified Food Starch, Dipotassium Phosphate, Tricalcium Phosphate, Tocopherols), Lecithin, Natural and Artificial Flavors, Salt, Acesulfame Potassium, Aminogen®, Sucralose, Lactase. SPOON STIRRED: Gold Standard 100% Whey™ is instantized. That means if you forgot your shaker cup or don’t have time to get out the blender, you can just add one rounded scoop of Gold Standard 100% Whey™ to a glass filled with 6-8 oz of water or your favorite beverage. Then mix it up with a spoon. Stir for about 20 seconds or until powder is completely dissolved. TIP: Adjust the intensity of your Gold Standard 100% Whey™ by varying the amount of liquid that you use to prepare it. For a bolder flavor with slightly more body and sweetness, mix each scoop with 4-6 oz of water, milk, or your favorite beverage. For a milder tasting, less sweet shake, use 8-10 oz of liquid per scoop. Protein Blend (Whey Protein Isolate, Whey Protein Concentrate, Whey Peptides), Cocoa (Processed With Alkali), Natural and Artificial Flavor, Lecithin, Salt, Gum Blend (Guar Gum, Gum Acacia, Xanthan Gum), Acesulfame Potassium, Sucralose. Protein Blend(Whey Protein Isolates, Whey Protein Concentrate, Whey Peptides), Cocoa(Processed With Alkali), Lecithin, Natural And Artificial Flavors, Acesulfame Potassium, Aminogen®, Sucralose, Lactase. Protein Blend(Whey Protein Isolate, Whey Protein Concentrate, Whey Peptides), Cocoa(Processed With Alkali), Lecithin, Natural Flavor, Acesulfame Potassium, Salt, Aminogen®, Lactase. Protein Blend(Whey Protein Isolate, Whey Protein Concentrate, Whey Peptides), Natural And Artificial Flavors, Lecithin, Cookie Crumbs(Enriched Flour[Wheat Flour, Niacin, Reduced Iron, Thiamin Mononitrate, Riboflavin, Folic Aicd], Sugar, PalmAnd Palm Kernal Oil, Cocoa[Processed With Alkali], High Fructose Corn Syrup, Corn Flour, Salt, Dextrose, Sodium Bicarbonate, Soy Lecithin, Salt, Gum Blend(Cellulose Gum, Xanthan Gum, Carrageenan), Sucralose, Aminogen®, Lactase. Protein Blend(Whey Protein Isolate, Whey Protein Concentrate, Whey Peptides), Cocoa(Processed With Alkali), Natural And Artificial Flavors, Lecithin, Creamer(Sunflower Oil, Maltodextrin, Modified Food Starch, Di-Potassium Phosphate, Tri-Calcium Phosphate, Tocopherols), Salt, Acesulfame Potassium, Aminogen®, Sucralose, Lactase. Protein Blend(Whey Protein Isolate, Whey Protein Concentrate, Whey Peptides), Natural And Artificial Flavors, Lecithin, Salt, Acesulfame Potassium, Aminogen®, Sucralose, Lactase. Protein Blend (Whey Protein Isolate, Whey Protein Concentrate, Whey Peptides), Natural and Artificial Flavor, Lecithin, Ground Cinnamon, Cocoa (Processed with Alkali), Salt, Gum Blend (Guar Gum, Gum Acacia, Xanthan Gum), Sucralose, Acesulfame Potassium. Protein Blend (Whey Protein Isolate, Whey Protein Concentrate, Whey Peptides), Natural and Artificial Flavors, Lecithin, Citric Acid, Sucralose, Acesulfame Potassium, FD&C Yellow #5, FD&C Blue #2, Lactase. Protein Blend (Whey Protein Isolate, Whey Protein Concentrate, Whey Peptides), Natural and Artificial Flavor, Cocoa (Processed With Alkali), Lecithin, Gum Blend (Guar Gum, Gum Acacia, Xanthan Gum), Salt, Sucralose, Acesulfame Potassium. Protein Blend(Whey Protein Isolate, Whey Protein Concentrate, Whey Peptides), Natural And Artificial Flavors, Lecithin, Acesulfame Potassium, Aminogen®, Sucralose, FD&C Red #40, Lactase. Protein Blend (Whey Protein Isolates, Whey Protein Concentrate, Whey Peptides), Natural and Artificial Flavors, Lecithin, Beet Color, Citric Acid, Malic Acid, Sucralose, Aminogen®, Yellow #5 & #6, Lactase. Protein Blend (Whey Protein Isolate, Whey Protein Concentrate, Whey Peptides), Cocoa (Processed With Alkali), Lecithin, Xanthan Gum. Protein Blend (Whey Protein Isolate, Cultured Whey Protein Concentrate, Whey Peptides), Cocoa (Processed With Alkali), Artificial Flavors, Lecithin, Acesulfame Potassium, Aminogen®, Lactase. Protein Blend (Whey Protein Isolates, Whey Protein Concentrate, Whey Peptides), Natural and Artificial Flavors, Lecithin, Ground Cinnamon, Cocoa (Processed with Alkali), Salt, Acesulfame Potassium, Sucralose, Aminogen®, Lactase. Protein Blend (Whey Protein Isolate, Whey Protein Concentrate, Whey Peptides), Cocoa (Processed With Alkali), Natural And Artificial Flavors, Lecithin, Acesulfame Potassium, Lactase. Protein Blend (Whey Protein Isolate, Whey Protein Concentrate, Whey Peptides), Cocoa (Processed With Alkali), Natural And Artificial Flavors, Lecithin, Creamer (Sunflower Oil, Maltodextrin, Modified Food Starch, Di-Potassium Phosphate, Tri-Calcium Phosphate, Tocopherols), Salt, Acesulfame Potassium, Sucralose, Lactase. Protein Blend (Whey Protein Isolate, Whey Protein Concentrate, Whey Peptides), Natural And Artificial Flavors, Lecithin, Salt, Acesulfame Potassium, Sucralose, Lactase. Protein Blend (Whey Protein Isolate, Whey Protein Concentrate, Whey Peptides), Cocoa (Processed With Alkali), Coffee, Natural And Artificial Flavors, Lecithin, Acesulfame Potassium, Sucralose, Lactase. Protein Blend (Whey Protein Isolate, Whey Protein Concentrate, Whey Peptides), Natural And Artificial Flavors, Lecithin, Salt Blend (Sea Salt, Sodium Chloride, Potassium Chloride, Sodium Gluconate), Cocoa (Processed with Alkali), Sucralose, Acesulfame Potassium, Lactase. Protein Blend (Whey Protein Isolate, Whey Protein Concentrate, Whey Peptides), Natural & Artificial Flavors, Cookie Crumbs [Sugar, rice flour, Cocoa (Processed with Alkali), canola oil, Salt], lecithin, Gum Blend [guar gum, gum acacia, xanthan gum], salt, sucralose, lactase. SHAKER CUP:Just pour in 6-8 oz. of your preferred beverage and then add 1 rounded scoop of Gold Standard 100% Whey to your shaker cup. Cover and shake for 25-30 seconds. ALLERGEN INFORMATION:Contains milk and soy. Intended for healthy adults over the age of 18. Protein Blend (Whey Protein Isolate, Whey Protein Concentrate, Whey Peptides), Natural And Artificial Flavors, Lecithin, Creamer (Sunflower Oil, Maltodextrin, Modified Food Starch, Di-Potassium Phosphate, Tri-Calcium Phosphate, Tocopherols), Salt, Gum Blend (Cellulose Gum, Xanthan Gum, Carrageenan), Acesulfame Potassium, Sucralose, Aminogen®, Lactase. Protein Blend (Whey Protein Isolate, Whey Protein Concentrate, Whey Peptides), Natural and Artificial Flavor, Cocoa (Processed with Alkali), Lecithin, Salt, Creamer (Sunflower Oil, Maltodextrin, Modified Food Starch, Dipotassium Phosphate, Tricalcium Phosphate, Tocopherols), Acesulfame Potassium, Sucralose, Caramel Color, Lactase. Protein Blend(Whey Protein Isolates, Whey Protein Concentrate, Whey Peptides), Coffee, Creamer (Sunflower Oil, Maltodextrin, Modified Food Starch, Di-Potassium Phosphate, Tri-Calcium Phosphate, Tocopherols), Lecithin, Natural Flavor, Acesulfame Potassium, Sucralose, Aminogen®, Lactase. Protein Blend (Whey Protein Isolates, Whey Protein Concentrate, Whey Peptides), Natural and Artificial Flavors, Lecithin, Beet Color, Citric Acid, Malic Acid, Sucralose, Aminogen®, Yellow #5 & 6, Lactase. Protein Blend (Whey Protein Isolate, Whey Protein Concentrate, Whey Peptides), Cocoa (Processed With Alkali), Lecithin, Natural & Artificial Flavor, Acesulfame Potassium, Lactase. Protein Blend (Whey Protein Isolate, Whey Protein Concentrate, Whey Peptides), Cocoa (Processed With Alkali), Natural & Artificial Flavor, Lecithin, Creamer (Sunflower Oil, Maltodextrin, Modified Food Starch, Dipotassium Phosphate, Tricalcium Phosphate, Tocopherols), Salt, Acesulfame Potassium, Sucralose, Lactase. Protein Blend (Whey Protein Isolate, Whey Protein Concentrate, Whey Peptides), Natural & Artificial Flavor, Lecithin, Cellulose Gum, Xanthan Gum, Salt, Sucralose, Acesulfame Potassium, Lactase. Protein Blend (Whey Protein Isolates, Whey Protein Concentrate, Whey Peptides), Cocoa (Processed with Alkali), Lecithin, Natural and Artificial Flavors, Acesulfame Potassium, Aminogen®, Lactase. Protein Blend (Whey Protein Isolates, Whey Protein Concentrate, Whey Peptides), Natural & Artificial Flavor, Lecithin, Acesulfame potassium, aminogen, lactase. Spoon stirred: Gold Standard 100% Whey is instantized. That means if you forgot your shaker cup or don't have time to get out the blender, just add one scoop of Gold Standard 100% Whey to a glass filled with 6-8 oz of water or your favorite beverage. Then mix it up with a spoon. Stir for just about 30 seconds or until powder is completely dissolved. TIP: Adjust the taste of your Gold Standard 100% Whey by varying the amount of liquid that you use to prepare it. For a bolder flavor with slightly more body and sweetness, mix each scoop with 4-6 oz of water, milk, or your favorite beverage. For a milder tasting, less sweet shake, use 8-10 oz of liquid per scoop. Shaker Cup: Bringing a shaker cup with you to the gym is the best way to get a dose of protein immediately after your workout. Just pour in 6-8 oz of you preferred beverage and then add one rounded scoop of Gold Standard 100% Whey to your shaker cup. Cover and shake for 25-30 seconds. Dont have a shaker cup? Visit your local health food store, gym, or optimumnutrition.com to order a custom ON shaker. We tried chocolate peanut butter flavor and were blown away by how incredibly well it was flavored! Perfect mix! 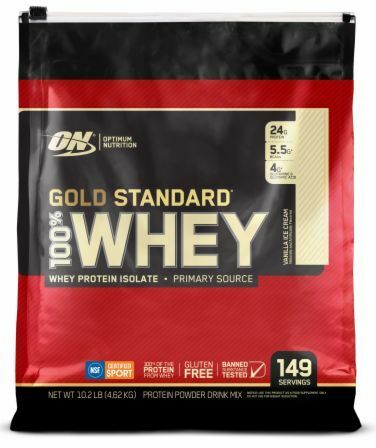 Optimum Nutrition's 100% Whey Gold Standard now contains lactase and Aminogen digestive enzymes to further enhance absorption and make this product even more friendly to lactose intolerant individuals. Cake Batter This is a Buy 1 Get 1 FREE offer! Chocolate Malt This is a Buy 1 Get 1 FREE offer! Chocolate Mint This is a Buy 1 Get 1 FREE offer! Coffee This is a Buy 1 Get 1 FREE offer! Extreme Milk Chocolate This is a Buy 1 Get 1 FREE offer! Mocha Cappuccino This is a Buy 1 Get 1 FREE offer! Rocky Road This is a Buy 1 Get 1 FREE offer! White Chocolate This is a Buy 1 Get 1 FREE offer!